Symphony orchestra of Moscow state P.I. Tchaikovsky conservatory has been created in September, 2007 for training graduate and post-graduate students of opera-symphonic conducting department of the Moscow conservatory, and also for concert activities by the initiative of the Peoples’s Artiste of the USSR, professor Gennady Rozhdestvenskij and the rector of the Moscow state conservatory, the Peoples’s Artiste of Russian Federation, professor Tigran Alihanov. The main conductor and the art director of the orchestra is the Honored Artist of Russia, professor of opera-symphonic conducting department of Moscow conservatory Anatoly Levin. During the short existence of the orchestra it has performed a considerable number of musical masterpieces among which are symphonies of Haydn, Mozart, Beethoven, Schubert, Brahms, Schumann, Mendelsohn, Mahler, Tchaikovsky, Scryabin, Rakhmaninov, Shostakovich, Schnitke etc. 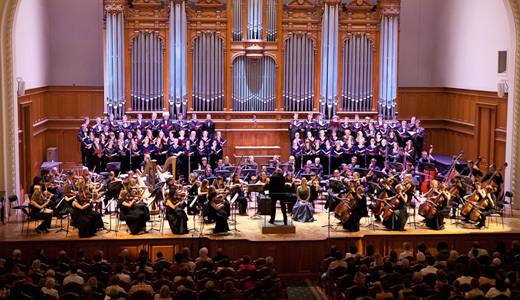 Since 2008 the orchestra has been awarded with honor to open a concert season in the Great Hall of Moscow conservatory. Many well known musicians have played with the orchestra as soloists: Alexander Rudin, Nikolay Petrov, Vladimir Ivanov, as Tigran Alihanov, Igor Gavrysh, Sergey Antonov, Eliso Virsaladze, Natalya Gutman, Dina Yoffe, Aleksey Lyubimov, Sergey Antonov, Aleksandr Buzlov and many others. In the 2008-2010 season the orchestra took part in the A. Gedike First international competition of organists, in concerts in memory of D. Oistrakh (the 100th anniversary from the date of a birth) and Kara Karaev memories (the 90th anniversary from the date of a birth), 150th anniversary of Mahler, 170th anniversary of Tchaikovsky. In the summer, 2009 the orchestra participated in Plasido Domingo’s concert in concert hall Luxury Village in Barvikha situated near Moscow. And another concert with Placido Domingo took place in April, 2010. During the season 2012-2013 Symphony orchestra of Moscow state P.I. Tchaikovsky conservatory under the direction of A. Levin has performed monographic programs dedicated to the greatest European composers in The Great Hall of Moscow Conservatory. On the occasion of the150th Claude Debussy anniversary the orchestra performed Rhapsody for clarinet, Fantasy for piano and orchestra. Other dates are 180th Johannes Brahms, 130th Igor Stravinski and 140th Sergey Rakhmaninov anniversaries. Anatoly Levin — Honored Artist of the Russian Federation, Professor of Moscow State Tchaikovsky Conservatory artistic director and conductor of the Symphony Orchestras of Moscow conservatory. In 1973-2007 he was a permanent conductor of Moscow Chamber Musical Theatre under the artistic direction of Boris Pokrovsky. He conducted a great number of opera productions of Shostakovich, Stravinsky, Hydne, Mozart, Bortnyansky, Schnittke, Holminov, Denisov and others. Since 1991 Levin leads the Symphony Orchestra of the Academic College at the Moscow State Tchaikovsky Conservatory. He performs regularly with this orchestra in the Great Hall of Moscoe conservatory and on other stages in Moscow and abroad. 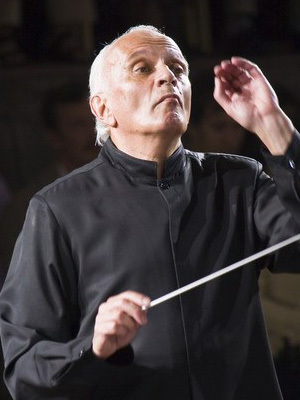 The conductor repeatedly took part in the international festivals in Berlin, Brighton, Duesseldorf, Prague, Budapest, Usedom.He performed with N. Petrov, N. Gutman, E. Virsaladze, A. Lubimov and with young artists S. Antonov, N. Borisoglebsky, A. Buzlov, J. Katsnelson and others. Maestro conducted many renowned orchestras in Russia, such as the Russian State Academic Symphony Orchestra, the Russian State Symphony Orchestra of Cinematography, the Academic Chamber Orchestra "Musica Viva", the Moscow State Philharmonic Symphony Orchestra, “New Russia” Orchestra, etc. Since 2002 Anatoly Levin Artistic conducts of the Youth Symphony Orchestra of the Volga region, CIS and Baltic States. With this orchestra he has performed in many Russian cities, he has taken part in festivals of V. Spivakov Foundation, International Festival of the Eurochestries in the region of Khanty-Mansiysk, in France (2004). In January, 2007 he performed as a guest conductor with the Symphony Orchestra of the Yale Philharmonic (USA). Since October, 2007 Levin is the artistic director and chief conductor of the symphony orchestra of the Moscow State Tchaikovsky Conservatory in charge of professional practice for students – conductors. The repertoire of this orchestra is surprisingly varied. It plays baroque, Russian symphony music, jazz and music from blockbusters. Only the level of performance stays constant, that is to say a unique quality of sound and emotion. In general, the range of its today’s projects fully reflect the multiple faces of the Hermitages exhibitions, the museum defined by its director M.B.Piotrovsky as an “ark of culture” of the modern world. The greatest privilege of this orchestra is participation in the opening of the Hermitage exhibitions in the main museum’s building and in various cities of Russia as well. 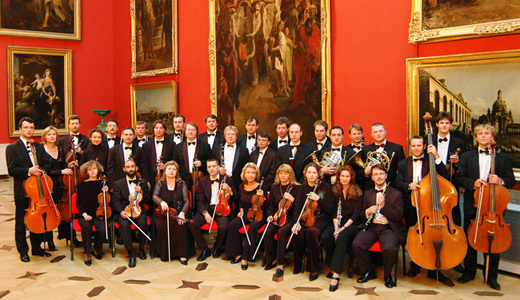 Being created as a “company of the soloists” the State Hermitage Orchestra also plays as a string chamber orchestra very often, and usually participating in the Hermitage events with the Ensemble of the Hermitage Orchestra Soloists. Conductors who worked with the orchestra: Y.Menuhin, M. Rostropovich, V.Spivakov, K. Penderecki, M.Shostakovich, V.Minin, A.Mustonen, K. Orbelian, F. Korobov, E. Kohn, F. Mastrangelo, D. Sitkovetsky and others. Soloists who performed with the orchestra: D.Shafran, N.Gutman, I.Monighetti, V.Krainev, S.Stadler, N.Petrov, V.Afanasiev, I.Oistrakh, V.Tretiakov, G.Zhislin, K.Ricciarelli, L.Kazarnovskaya, N.Gedda, B.Bonney, L.Leskowitz, S.Nakariakov, Z.Bron, V.Galusin, V.Gerello, E.Obraztsova, R.Alagna, S.Radvanovsky, E.Bolkvadze, F.Mondelci, M. Jevtic, M.Safariants, G.Garanian, D.Khvorostovsky, V. Gerello, R.Fleming, A. Knyazev, Misha Maisky, ex-Deep Purple Jon Lord, Andrea Bocelli, Paul Badura-Skoda. Since 2009 the conductor of the State Hermitage Orchestra is Fabio Mastrangelo. Felix Korobov — Honored Artists of the Russian Federation. He graduated from Moscow P.I. Tchaikovsky state conservatory as a cellist (1996, in the class of Professor M. Tchaikovskaya) and opera and symphonic direction (2002, in the class of Professor V. Sinaisky). He took post-graduated course of string quartette (under A. Shishlov). Among the teachers are prominent professors of Moscow conservatory: T. Gaydamovich, A. Bonduryansky, R. Davidyan, K. Khachaturyan. 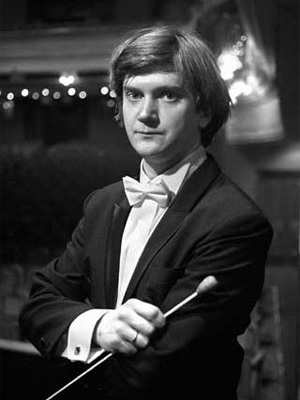 Felix Korobov began his conductor career in Russian state academic orchestra (2000-2002, main conductor’s assistant). During following three years he was combining the position of the main conductor in two leading Moscow theatres — Stanislavsky and Nemirovich-Danchenko Moscow Music Theatre (since August, 2008 up to date) and The Kolobov Novaya Opera theatre (2004-2006). He is an artistic and stage director of such performances as Golden Cockerel, Eugeny Onegin, Traviata, May night, Hamlet, Sea-gull, Cinderella, Stone Flower, Neapol (Stanislavsky and Nemirovich-Danchenko Moscow Music Theatre), Tsar’s Bride, Norma (Novaya Opera), Spartak (German Opera on the Rhine, Duesseldorf). Korobov has collaborated with outstanding ballet-masters:John Neumeier, Oleh Vinogradov, Yury Grigorovich, Yury Vamosh. In Moscow theatre repertoire of Felix Korobov are over 30 performances, including five operas of Rimsky-Korsakov, The Queen of Spades, Madame Butterfly, Romeo and Juliet, Don Quijote etc. Felix Korobov tours as a contuctor and a cellist. He has collaborated with orchestras in Russia, Austria, Slovemia, Germany, Finland, Italy, The Philippines and others. He is a main guest-conductor of The state Hermitage orchestra under the direction of S. Sondeckis (Camerata of Saint-Petersburg). He took part in numerous Russian and international music festivals. Since 2007 Felix Korobos is an artistic director and main conductor of the Chamber orchestra of Moscow conservatory. The conductor has made a lot of CD-recordings, including the performances with Russian state academic orchestra.